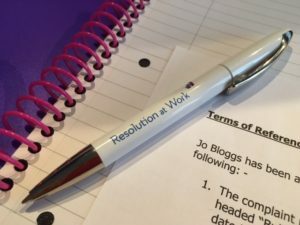 The benefits of carrying out a robust workplace investigation cannot be underestimated; it will ensure that employees feel that their cases have been fully heard thereby reducing the number of appeals as well as reducing risks of cases succeeding at Tribunal and the time / costs associated with defending claims. The skills required are a mix of analytical, organisational and so called “soft skills”. Here are our top 10 tips to keep in mind when carrying out workplace investigations. Act quickly but not in haste. It is important to act quickly before memories fade and to ensure that matters do not drift. Whatever the circumstances those involved will be anxious and concerned and it will be unsettling for everyone. However, do not act in haste; take the time to investigate key matters properly. Be clear about your terms of reference. If you are investigating a grievance be clear you agree and clarify the allegations. If it is a disciplinary, the allegations should be clearly stated as these determine the extent of your investigation. Wherever possible agree the terms of reference with those concerned. Preparation and planning. Be clear what needs to be proven and what evidence you need/is available. Gather all the documentary evidence and review in advance of interviewing witnesses. Avoid the temptation to gather absolutely everything you can think of, concentrate on evidence that relates directly to the allegations made. Disclose all relevant evidence. If evidence is being relied upon, it is only right that it is put to the person concerned. You may need to consider confidentiality and in some cases a need to protect witnesses’ identities, however wherever possible be as open as possible and avoid trying to trick witnesses by keeping key information or evidence back. Research shows that you get much better quality and more reliable evidence with this approach. Deal with witnesses appropriately. Put them at ease, don’t rush the niceties of gaining trust and rapport; it’s important. Explain who you are and your role in the process, be clear what will happen next. Be empathetic and do not rush them. Regularly demonstrate that you have truly listened and understood what they are saying by summarising back what you have heard. Questioning techniques. Use a conversational style; ask open questions and try to encourage witnesses to talk freely. Don’t interrupt when witnesses are recalling events, ask questions later. Again, this will ensure the evidence is more reliable. Remain neutral and objective. However hard it may be, remain curious throughout and do not assume guilt or try to get the facts to fit an assumption of guilt or innocence. Wherever possible ensure that the investigator is as independent as possible and unconnected with those involved. Write a clear report. Your report should make it clear how you have come to the decision that you have and it should be easy to read. It should set out findings of fact and the evidence you have relied upon and give a clear picture for the determining officer to base their decision on. Don’t sit on the fence. It is an uncomfortable place that too many sit on! It satisfies no one and can lead to far greater problems in the future. For further information about our workplace investigation services or training please see here To book our next open training in Cardiff on 20th November 2018 see here. Or contact us for any in-house training needs or workplace investigation services at [email protected] 01446 760993 (Wales) or [email protected] 0117 330 5980 (England) to discuss.